A recent environmental assessment of the first president's Virginia home confirmed the 18th century mansion could not maintain museum-quality standards, so a few vulnerable pieces were moved out, including the Longman & Broderip harpsichord Washington ordered from London. MOUNT VERNON, Va. (AP) — Shortly after retiring from his role as conservator and curator of musical instruments at Colonial Williamsburg, John Watson received an interesting request from the folks at Mount Vernon: They wanted him to build a playable replica of the harpsichord George Washington acquired for his step-granddaughter, Nelly Custis, in 1793. A recent environmental assessment of the first president’s Virginia home confirmed the 18th century mansion could not maintain museum-quality standards, so a few vulnerable pieces were moved out, including the Longman & Broderip harpsichord Washington ordered from London. That’s when Watson got the call and got to work carving the keys and cutting the jacks for its replacement. This year, when visitors walk through the mansion’s little parlor, they’ll once again be able to see the instrument that played such a prominent role in life at Mount Vernon. And for the first time, they’ll also be able to hear it. “And we’re able to hear that sound again, without any impact at all on the original harpsichord,” said Watson, who explained restoring the original instrument was a possibility, but replacing its broken parts with newer pieces would have made for an inauthentic sound experience. The harpsichord — which produces its unique sound by plucking strings — started to lose its luster in the late 18th century as the piano rose to popularity. Even though it was “phasing out,” Watson said the instrument’s capabilities continued to develop into the 1790s, and Washington went for a top-of-the-line model. He likens the 61-key, 93-inch-long harpsichord that Washington ordered for Nelly, who he and Martha raised at Mount Vernon, to a fancy car that can parallel park itself. 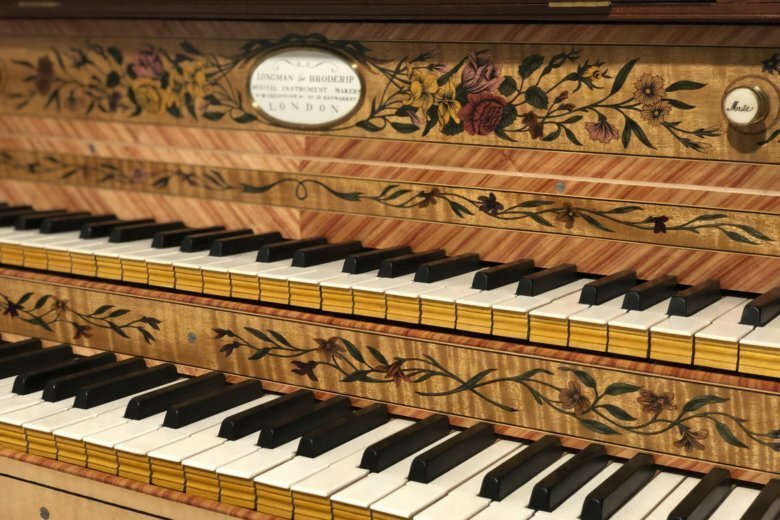 “What we have with the Mount Vernon harpsichord is a harpsichord that is different from any other surviving period harpsichord,” Watson said, referring to its distinctive leather plectra, Venetian swell and machine stop. Mount Vernon curator and Executive Director of historic preservations and collections Susan Schoelwer said music played an important role in life at Mount Vernon. The harpsichord was played during dinners and dances. Nelly also played it to entertain the president’s VIP visitors, so being able to hear it at the mansion will help visitors better understand the history of the family, the house and the period. “I see going through a historic site, like Mount Vernon, as the ultimate immersive experience — being able to put yourself imaginatively back into what it was like in the 18th century. And in most sites, that’s often largely visual,” Schoelwer said. Throughout the year, Mount Vernon will host events focused on the harpsichord, including tours, recitals, discussions and symposiums.